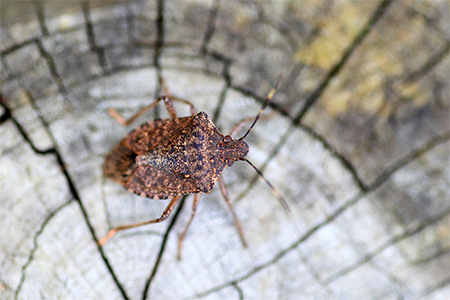 It is not unusual for us to get calls from people who have severe stink bug infestations. Some of those customers have tried everything to get rid of those stinkers, including commercially marketed stink bug traps. We can recall at least one time where the customer admitted that they had dramatically more stink bugs on their house after they put up a stink bug trap than they had before. She even complained that the stink bugs were on the outside of the trap, but very few made it into the trap. The reason she had many more stink bugs after using the trap was easily apparent to us. The trap is designed to work by mimicing a pheromone that stink bugs use to attract other stink bugs to them. The natural pheromone is very effective. People have reported finding thousands of stink bugs clustered together, evidently because they followed the scent of the pheromone. Stink bug traps operate very much similar to how mosquito magnet traps work. In a previous blog, we discussed the problem with mosquito traps. In fact, the Maryland Department of Agriculture has reported that mosquito traps help to count mosquito populations, but is not effective in controlling them. That is likely the case with stink bug traps. On the other hand, one frequent question we get about our service is: does it repel the stink bugs? Those two scenarios set up the key question about stink bug traps. Do you want to repel or attract stink bugs to your home? Unless you are a scientist wanting to do some experiments on them, or you get some, dare we say weird, pleasure out of counting and killing stink bugs in your home, you would prefer to repel them. Based on our experience, and a recent story we read, we think that stink bug traps are a risky way to deal with a stink bug invasion. In the study reported in Entomology Today, 15 homeowners placed stink bug traps near their tomato plants. A control group of 14 other homeowners did not place traps near their tomatoes. The researchers claimed that they saw as many stink bugs on the tomatoes in all yards, but noticed that there was more damage to the tomatoes where the stink bug traps were placed. The researchers said perhaps it was due to “spillover” from the trap. In other words, the trap may not have been able to hold all the stink bugs it attracted? Or stink bugs came to the area and were on the tomatoes before going into the traps? In our opinion, stink bug traps may capture some stink bugs, but if they successfully mimic the pheromone that attracts stink bugs, it can make the problem worse. Sometimes, much worse. Your chance of success with a trap may also depend on several other factors requiring great expertise and timing. When we treat for stink bugs, we have received anecdotal reports of stink bugs not coming back for a while and we have more commonly heard stories of thousands dying when they arrive at the front porch. It’s hard to say if it is repelling stink bugs, or just killing them when they come. We do know that our product in general does have a repellent effect on many insects, including mosquitoes. So, it may repel some stink bugs, but it will kill those that are not repelled. Our product will eliminate your stink bug problem, not exponentially increase, which is the risk of using traps. For any questions about stink bug control, or to request our expert services, call us at (301) 263-7220.